Need more info? View our Freeride / Bike Park Mountain Bikes buyer's guide. Canyon unveils their big-hitting quiver-of-one for the all-mountain, uplift and enduro junkie. There's also a new aluminum DH bike. See the rigs up close and hear our impressions after two days of Madeira madness. Many young whipper snappers won’t remember the days where you either had a bike that could climb or a bike that could descend. Those of us who can remember truly appreciate how much technology and design have improved, in addition to the blurred line between the either/or of yesteryear. 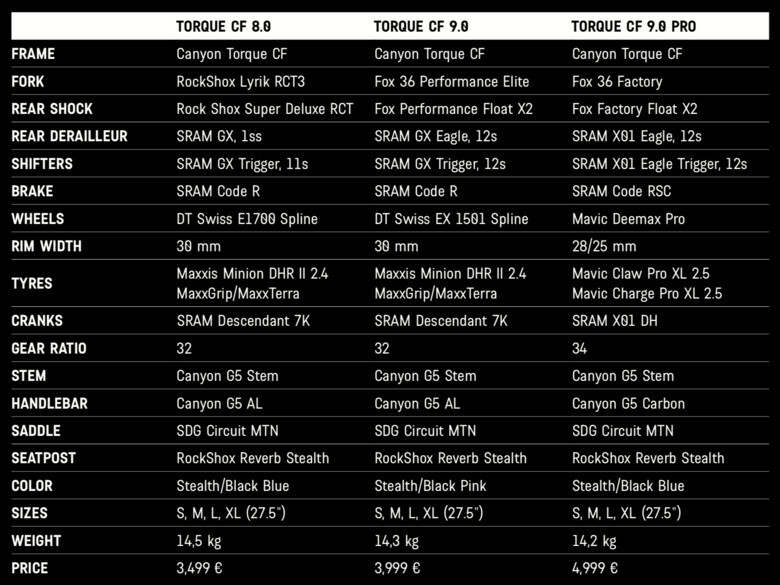 Canyon is blurring the line even further with the introduction of their updated Torque. This long-travel machine is said to be capable of a weekend of shuttles, all-day epics, and the odd enduro race thrown in for good measure. Canyon’s latest ground-up redesign features a front end similar to their Sender and a rear end much like the Strive. The business in the front, party in the back approach combined with a whopping 175mm of rear travel just might be the ticket for those looking to ride seriously heinous terrain without suffering on the climb for a second lap. The suspension design of the new Torque is a familiar four-bar linkage, similar to what they have used in the past. Engineers utilized the kinematics from their Sender CF bike as a jumping off point, then made adjustments as needed in order to provide the character they were after for the Torque. The lateral shock orientation has allowed Canyon to make use of Metric shock sizing, in addition to providing improved standover and room for a 170mm travel dropper post on large and extra-large frames. The new Torque features Canyon’s Triple Phase suspension kinematics, just like their recently released Spectral, although it utilizes a different linkage design to achieve the end result. While some brands prefer to choose one suspension strategy and use it across the lineup, Canyon has given their designers the freedom to choose whatever suspension layout they require in order to achieve their design goals for a particular bike. In addition to ride quality, durability and longevity were key factors when designing the Torque which led engineers to the proven four-bar layout. The "Triple Phase" concept is similar to that of the Sender CF and isn't unlike many other progressive linkages. First, the response phase provides excellent small bump compliance with enough anti-squat that the Torque isn’t a chore to climb. Once sagged the suspension becomes much more supportive and stable. This allows for plenty of trail feedback and a platform that riders can press into for pumping along. The final phase is a good helping of end-stroke progression because the Torque is definitely a bike that will be seeing plenty of airtime and high-speed compressions. Compared to the new Spectral, the Torque has a much more DH-focused feeling, which isn’t a surprise given the intended purpose. "Improved anti-squat means that the bike pedals well, but it also causes increased pedal kickback," said Canyon. "We struck a balance between the two that actively increases the rider’s momentum without causing instability or fatigue over fast repetitive hits." Call it what you want: super-enduro, freeride, park, or mountain biking, an ever-increasing number of riders are doing away with quivers of bikes in favor of a single machine capable of anything thrown at it. Canyon’s approach with the Torque was to create a durable, capable, and fun bike that’s ready for anything. We already referred to the Triple Phase suspension, which – in combination with geometry, frame material, and components – is meant to enable riders to literally go anywhere, ride anything, and have a smile while doing it. 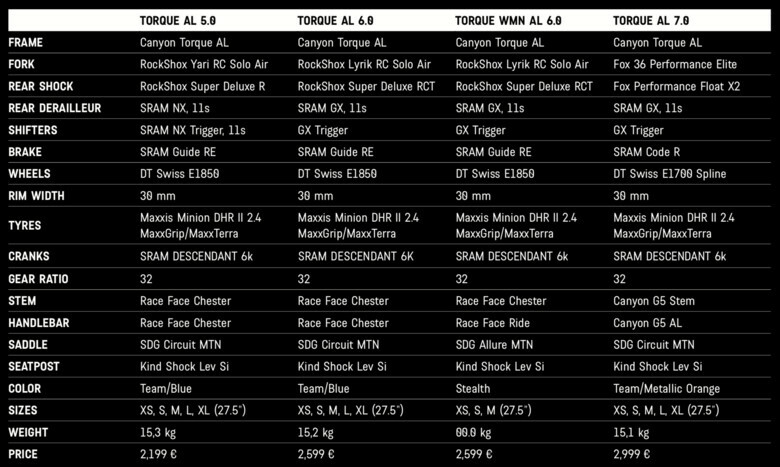 The Torque’s geometry features a few notable traits. First and foremost, the front and rear ends are quite similar to the Sender CF and Spectral, respectively. The outcome is the stability of a DH bike on the front end combined with the agility and playfulness of a trail bike in the rear. Business in the front, party in the back. The ‘unruly’ portion of the geometry comes through a few different means: the reach on a size large Torque is identical to that of the Spectral, however the slacker head angle and additional rear travel give the Torque a much more gravity-focused feel. The Torque utilizes even shorter chainstays than the Spectral, which measure in at a compact 425mm. Canyon deliberated about geometry adjustments, but they elected to go without the option on the Torque to keep things simple. 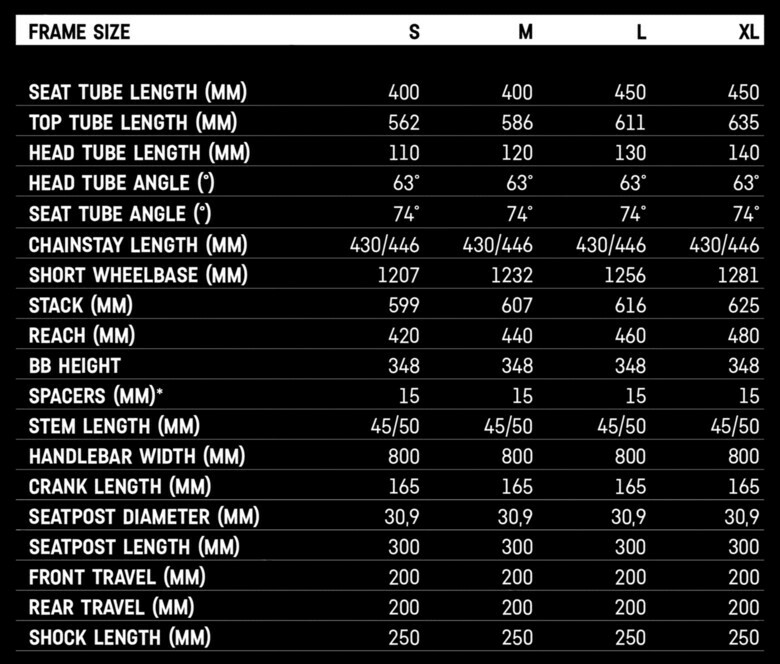 For the sake of comparison: chainstay length is slightly shorter than the new Santa Cruz Nomad, with an additional 10mm of rear travel. The mullet analogy came from this seemingly divergent approach to the Torque’s geometry, which certainly deserves the ‘unruly’ label and offers the potential for a unique character. The front and rear ends are quite similar to the Sender CF and Spectral, respectively. The outcome is the stability of a DH bike on the front end combined with the agility and playfulness of a trail bike in the rear. The ‘unbound’ portion of the Torque’s geometry suggests that it shouldn’t be limited in any regard, including getting to the top of the hill. The effective seat tube angle sits at 74-degrees which puts riders in a comfortable climbing position. The compact rear end also puts your weight right on top of the rear tire to help find traction while climbing. With ‘unruly, unbound, unreal’ as the phrase of choice for the Torque, it had better be dang tough and engineers knew it. The design team ensured that frame strength went well beyond industry standards. From road bikes to downhill race sleds, Canyon’s in-house strength testing is divvied into five categories. The Torque is worthy of the Category 5 label, something only shared with the strongest frame in their lineup – the Sender CF downhill bike. On the Torque CF, Canyon chose to forego a carbon rear triangle in favor of 6066 aluminum knowing that rock strikes, shuttling, and frequent mistreatment were likely. To help with all that punishment, fully-sealed industrial bearings connect all of the moving pieces. Buyers have the choice between a hybrid carbon front and aluminum rear frame called the "CF," or the full 6066 aluminum "AL" which adds only a few grams in order to keep cost down. Like the new Spectral, the Torque features a unique approach to cable management by routing cables externally under the downtube but managing and protecting them using an integrated bolt-on "Cable Channel." This not only keeps the bike extremely quiet, but provides downtube protection. We aren’t fans of the cables running under the bottom bracket, but we’ve also spent our fair share of curse words while routing cables internally or watching muck drain from cable ports, and we appreciate the simplicity, ease of service, and rattle-free ride that Canyon’s design allows. Our day aboard the Torque included various trails used during the Madeira Enduro World Series race, "Ratboy" (utilized for Madeira Dreaming), and a few local treasures. Conditions were soggy to say the least, which made getting a good impression of the Torque’s traits a challenge but it kept things very entertaining – media squid crashes were plentiful. Canyon designers noted that they tried to strike a balance between anti-squat and initial suspension sensitivity – our impression was that the Torque climbs much better than a borderline DH bike ought to. We referred to the Torque above as business in the front, party in the back. The mullet approach was evident within a handful of meters. As we made our way to the first descent we couldn’t help but enjoy the short chainstays, even while climbing. The Torque wheelies very easily due to the short rear end and supportive platform. No bike with 175mm rear travel can be expected to be an outstanding climber, but the Torque does make its way uphill more efficiently than anticipated. The roomy cockpit and steep seat tube provide plenty of space for a comfortable climbing position. Canyon designers noted that they tried to strike a balance between anti-squat and initial suspension sensitivity – our impression was that the Torque climbs much better than a borderline DH bike ought to. While descending the Torque was lively and playful. Our first trail, Ratboy, was full of natural and man-made doubles and supportive corners. These trail features highlighted the Torque’s firm mid-stroke which rewarded pumping and jumping with bursts of speed. Our first trail, Ratboy, was full of natural and man-made doubles and supportive corners. These trail features highlighted the Torque’s firm mid-stroke by rewarding pumping and jumping with bursts of speed. Once things are truly gravity-fed and a bit rougher, the Torque’s suspension does a good job of balancing trail feedback with compliance. Rocky sections weren’t jarring, nor did we have any issues with harsh bottom-outs, but undulating terrain can be ‘felt’ more compared to many of the trail-muting race bikes we’ve had the opportunity to ride. The firmer-feeling suspension does not mean that the rear end is skittish, however, as we also found that the Torque handles successive holes and braking bumps quite well. That being said, the Torque isn’t the bike for sitting into the suspension for full-time monster trucking – the Sender is the better option there. Rocky sections weren’t jarring, nor did we have any issues with harsh bottom-outs, but undulating terrain can be ‘felt’ more compared to many of the trail-muting race bikes we’ve had the opportunity to ride. Overall, the bike is playful, poppy, and nimble for its travel. It is cumbersome without a steady supply of gravity, however, and overkill at moderate speeds. Along with the brand new Torque comes Canyon’s own G5 component line, which includes carbon and aluminum handlebars, two types of stems, and lock-on grips. 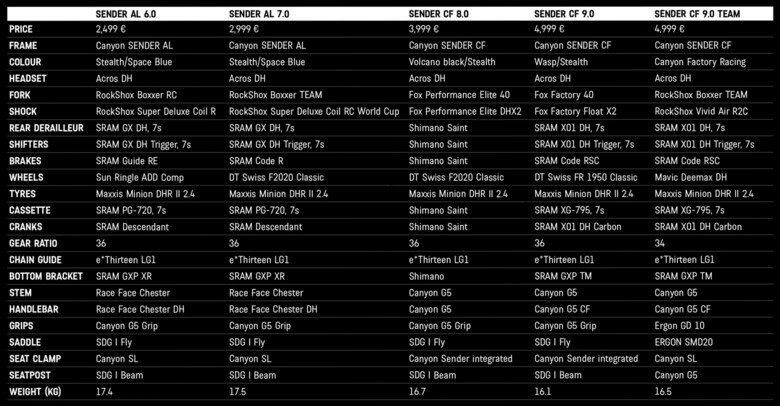 While in-house components might be perceived purely as a cost savings measure, Canyon’s G5 lineup is named after the components’ top tier strength rating. Canyon chose to utilize their design experience to create cockpit components as a means of providing riders with high quality parts. We found it very interesting that each carbon bar is analyzed for quality using an in-house CT scanner. Canyon chose to utilize their design experience to create cockpit components as a means of providing riders with high quality parts. We found it very interesting that each carbon bar is analyzed for quality using an in-house CT scanner. The G5 carbon bar on our Torque was stiff without being harsh and is nearly identical to the much beloved Renthal handlebar at 5-degrees upsweep and 8-degrees back (Renthal is 5 and 7-degrees, respectively). A variety of Sender, Torque, and Stitched models will come equipped with the new components. They're also available directly through Canyon. Canyon makes four build kits with aluminum Torque frame, one of which is specific to women, plus an additional three kits for the Torque CF. Bikes will be available in early 2018. We rode the high-end Torque CF 9.0 Pro, but the entire lineup has sensibly chosen parts. For the Gucci build, FOX handles suspension duties with a metric Float X2 shock in the rear and Float 36 fork up front. SRAM handles drivetrain and braking with the new Code RSC brakes being a highlight. Canyon’s own G5 bars, stem, plus Mavic Deemax wheels and rubber round out the package. The Mavic Claw and Charge tire combination felt as though they couldn’t meet the capability of the rest of the bike, but the trails were “Madeira rock” slippery so we’re not sure whether our go-to rubber would have fared much better. In addition, we would prefer full high and low-speed adjustments on the fork rather than the three-position damper, especially with the highly adjustable Float X2 shock in the rear. There are a few small differences between the new aluminum Sender and its carbon sibling. Most notably, the aluminum version was altered to better suit a coil shock and has a simplified lower MX suspension link. There are a few small differences between the new aluminum Sender and its carbon sibling. Most notably, the aluminum version was altered to better suit a coil shock and has a simplified lower MX suspension link. Canyon made these changes and went with aluminum to provide buyers with a streamlined, more affordable DH sled for banging out laps at the bike park with little concern about maintenance. Engineers noted that the lower link simplification has little effect on suspension performance, and riders who don’t constantly tinker with rear-end setup for each track are likely better served by the more affordable Sender AL. In the US, the Sender AL 5.0 will be offered at $2,999 USD. Canyon claims that “the only thing holding back the new Torque is your imagination.” In our brief experience, this statement rings pretty true. Canyon has put together a niche bike for riders who want to spend weeknights riding gnarly trails and their weekends at the local bike park hitting gaps. While 175mm of travel is overkill in places, the Torque handles climbing and moderate terrain better than it ought to which is an added bonus. Those who aren’t afraid to push their limits and are looking to have the most fun rather than shave milliseconds should look closely at the reinvigorated Canyon Torque. Those looking for a dedicated downhill bike will find great value in the new Sender AL. Visit www.canyon.com for more details. Joel’s unique coaching background and willingness to tinker with products bring an objective perspective to testing. He dabbles in all types of racing, but is happiest simply exploring the limitless trail networks surrounding his home of Squamish, BC. Attention to detail, time in the saddle, and an aggressive riding style make Joel a rider that demands the most from his products while exposing any shortcomings. Front: Mavic Claw Pro XL, 27.5" x 2.5"
Rear: Mavic Charge Pro XL, 27.5" x 2.5"
The warranty period on Canyon frames, excluding bearings and shocks as well as damage to the paintwork/anodization, and Canyon forks, is six (6) years from the date of the original purchase. Cable channel for internal routing - Durable plastic attachment provides clear and secure channels for all cables and can be removed for servicing. Seamlessly integrates into the frame. Also serves as a bash guard to protect the frame from hits. Simple and affordable to replace if required. Equipped with fully-sealed industrial bearings.